The 336-pound oblong block of red sandstone that is displayed alongside the Honours of Scotland in Edinburgh Castle has a long and mysterious history. Its origins are shrouded in myth. 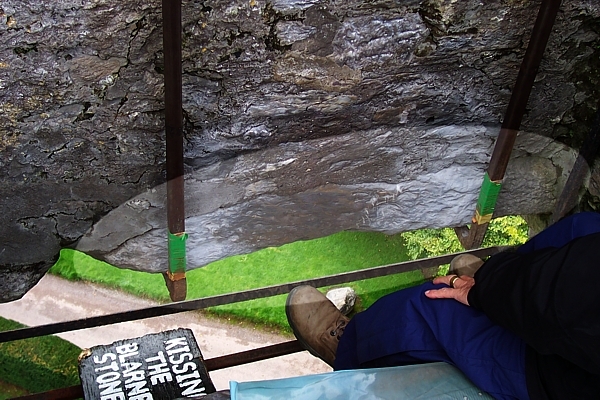 Legend maintains that the Stone of Destiny was the stone on which Jacob, the Biblical patriarch, rested his head when he had his vision of a ladder to heaven. How it arrived in the British Isles remains a mystery. Tradition holds that it came from Palestine and was carried through Egypt, Sicily, Spain, and Ireland before finding its home in Scotland. There is truth to the claim that the stone most likely came from Ireland, but there is some debate as to why it was brought over, and by whom. Some sources maintain that the Dál Riata monarchs used it as their coronation stone and brought it with them when the settled Caledonia. Others believe that it was a portable altar used by Saint Columba during his missionary work in Pictavia. Whatever the stone's original purpose, it came into its historical use as a coronation chair when Columba anointed and crowned Aedan Mac Gabrain King of Dál Riata on it in 574 A.D. It was henceforth used as the coronation stone for all subsequent kings of Dal Riata, and then kings of Scotland. The Stone of Destiny was initially kept by the monks of Iona, the headquarters of the Scottish church, until Vikings ransacked the island in the late eighth century, forcing the monks to move it to the mainland. The stone was transported from Dunkeld to Atholl and then to Scone, where it continued to be used in coronation ceremonies. According to medieval chroniclers, the stone was shiny and black (perhaps a fragment from a meteorite), and kept near the abbey's high altar. One of the earliest symbols of Scottish nationhood, the Stone of Destiny made an obvious target for Edward I of England when he invaded Scotland in 1296. After sacking Berwick, defeating the Scots at Dunbar, and laying siege to Edinburgh Castle, Edward proceeded to Scone, intending to capture the sacred relic as a spoil of war. 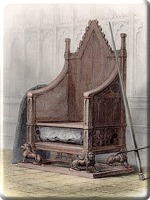 He nabbed a large lump of sandstone from the altar in Scone Abbey and sent it back to Westminster Abbey, where it was fitted into the wooden chair on which all subsequent English monarchs (with the exceptions of Queen Mary I, Queen Mary II, and King Edward VIII) have been crowned. By placing the seat of Scottish kingship within the throne of England, Edward asserted his claim of sovereignty over Scotland, which he considered to be a vassal state of England, and his right to rule over it as "Lord Paramount". This stone remained in England for seven hundred years before it was returned to Scotland. There is, however, some doubt that Longshanks made off with the true Stone of Destiny. The English army assembled at the Scottish border in mid-March, but did not reach Scone until June. 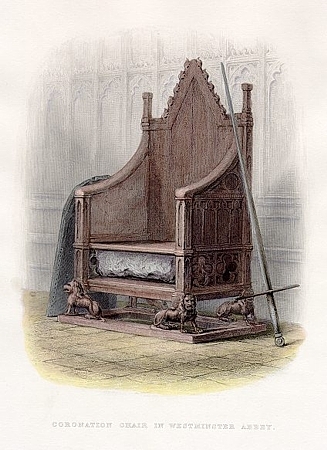 With three months to anticipate Edward's arrival, the Abbott of Scone, the stone's custodian, had ample time and incentive to switch the original relic with a substitution in order to protect it. If the monks of Scone Abbey did hide the original Stone of Destiny (some stories suggest that they buried it in the River Tay or on Dunsinane Hill) from Edward, they did such a good job that no one has ever found it. The theory that the stone in St. Edward's Chair in Westminster Abbey is not the original Stone of Destiny remains credible for several reasons: first, its dimensions (26" x 10.5" x 16") make it appropriate for use in a building. An ancient-looking, weathered piece of rock that had been rejected by builders would be much more likely to fool the English than anything newly-hewn. 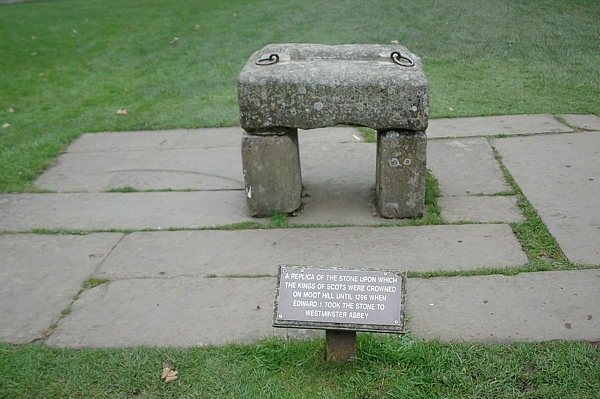 The stone, furthermore, has a weak point, which was demonstrated by the fact that it broke in half in 1950 when a group of students attempted to remove it from Westminster Abbey. Furthermore, the Westminster Stone is not the stone of Iona chronicled in early documents, which recorded a shiny, black stone marked with elaborate carvings. Geologists have confirmed that the Westminster Stone is composed of Old Red Sandstone and was quarried in the vicinity of Scone. Legends associated with Robert the Bruce also support the argument that Edward stole an imposter stone. Reports of his 1306 coronation record that it was done according to the full tradition - and the full tradition required the Stone of Destiny. Another legend holds that Robert the Bruce gave a portion of the stone to Cormac of McCarthy, King of Munster, in gratitude for Irish support at the Battle of Bannockburn in 1314. 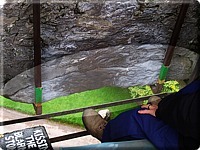 McCarthy installed this gift at his stronghold, Blarney Castle, which later became famous as the Blarney Stone. There is a second reason why the stone that England returned to Scotland in 1996 might not have been the original Stone of Destiny: on Christmas Day in 1950, a group of four Scottish students snuck into Westminster Abbey and stole the stone with the intention of returning it to Scotland. In the process of removing it, however, it broke in half. The students transported the Stone across the border into Glasgow, where a senior local politician arranged for stonemason Robert Gray to repair it. Perhaps assuming that the Kirk of Scotland would not return the Stone to England, the Stone's custodians left it on the altar of Arbroath Abbey on 11 April 1951. Once London police learned of its whereabouts, it was transported back to Westminster. Afterwards, rumour began to circulate that the police had retrieved a recently-made counterfeit from the altar. 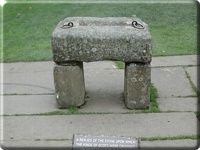 In response to growing political discontent in Scotland, the British government decided in 1996 that the Stone of Destiny should be kept in Edinburgh when not in use at coronation ceremonies. After a handover ceremony between representatives of the Home Office and the Scottish Office at the border on 15 November 1996, the Stone of Destiny was transported to Edinburgh Castle, where it remains on display with the Honours of Scotland. Is the Stone on display at Edinburgh the original coronation seat of the ancient Scottish monarchs? Or is it a thirteenth or twentieth century copy? The answers to these questions remain a mystery.